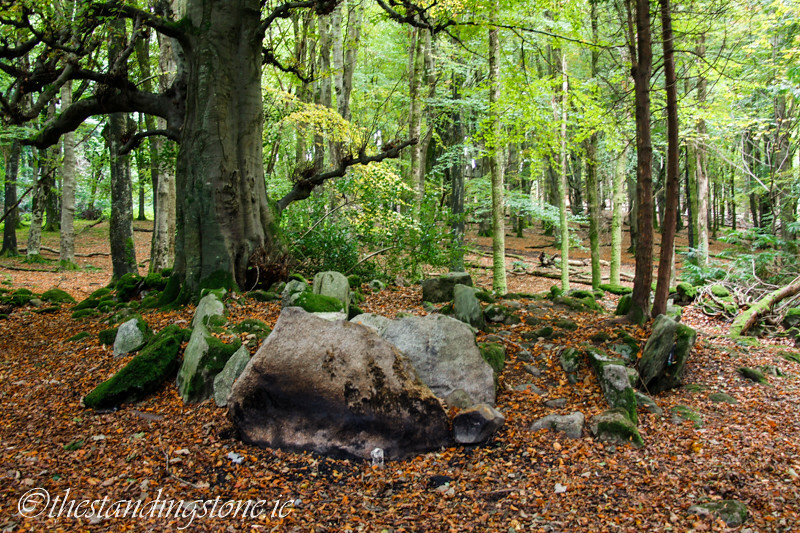 The Standing Stone: Killakee Wedge Tomb, Massey's Estate, Co. Dublin. 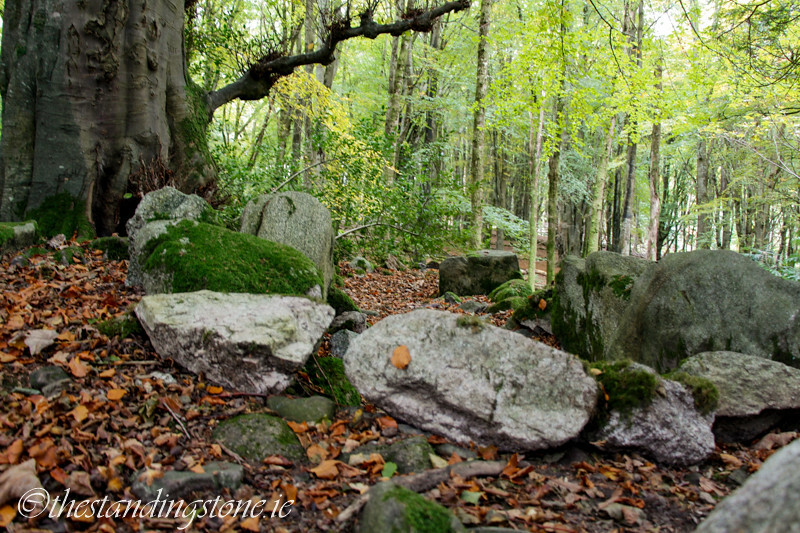 Killakee Wedge Tomb, Massey's Estate, Co. Dublin. Location – Located in Massey’s Estate Forest Park this tomb can seem a little tricky to find as there’s no signage but it’s actually quite simple. Follow the laneway as you enter the park for about 10 minutes. You will go over a bridge and soon reach a second with an old mill building on the other side. Do not cross the bridge but turn right through the forest following the stream and the old stone wall. 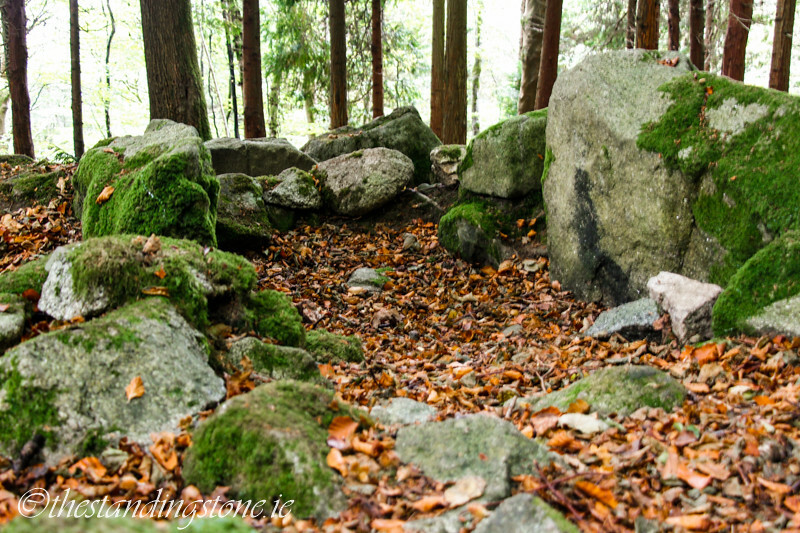 This wall will lead you right to the tomb about 200m into the forest. Description and History – I had really no idea what to expect from this site as I hadn’t researched it before visiting. I was across the road visiting the excavations at the Hellfire Club where the archaeologists recommended visiting this place. Thank you to them for their stellar directions as I was without a map and I found it with relative ease. 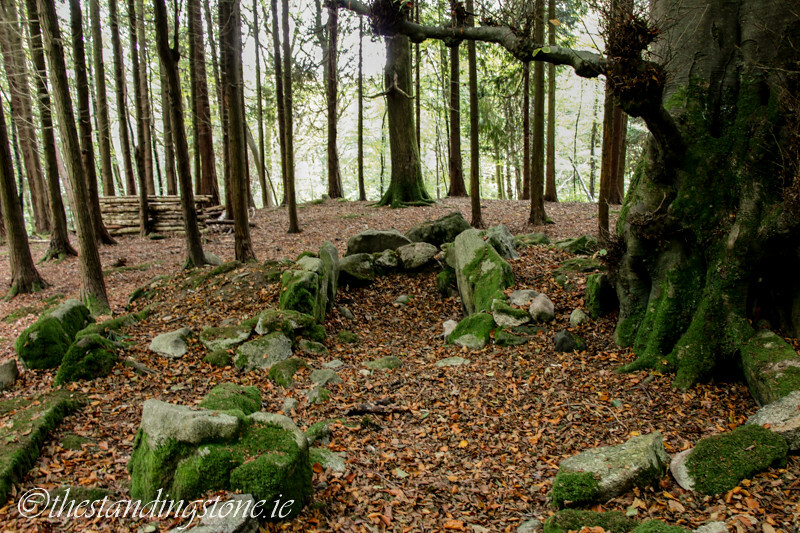 It seems that this wedge tomb is not visited very often and that not many people know about it. I asked three sets of people walking through the forest if I was heading in the right direction for the tomb and none of them had a clue what I was talking about. But, heading in the right direction I was and I soon found it. The tomb is missing its cairn material and roof slabs but the chamber is still clearly visible and measures about 5m in length. It appears to be in an L shape which could be evidence of a forecourt of possibly a second chamber although I think that’s unlikely. 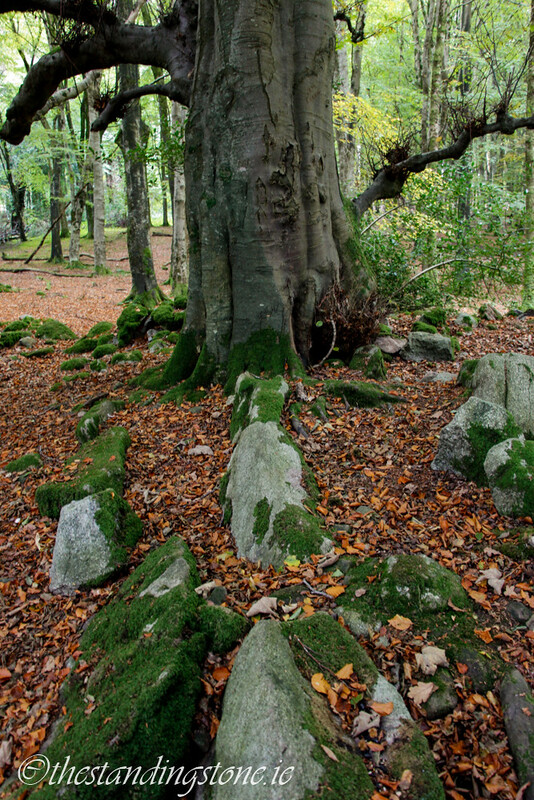 It’s situated on a low, irregular mound with a tree located on its southern side. The chamber itself consists of an entrance at the western end and is formed with seven remaining stones along the walls and one forming the end of the chamber at the eastern end. There is double walling here of which 17 stones survive. This is set quite apart from the main walls of the chamber and I first assumed it was a kerb but there is a third set of stones around the tomb which is probably a kerb although Megalithomania.com has speculated that this tomb has triple walling. There is a large stone near to the site which may be one of the former roof slabs of the tomb. 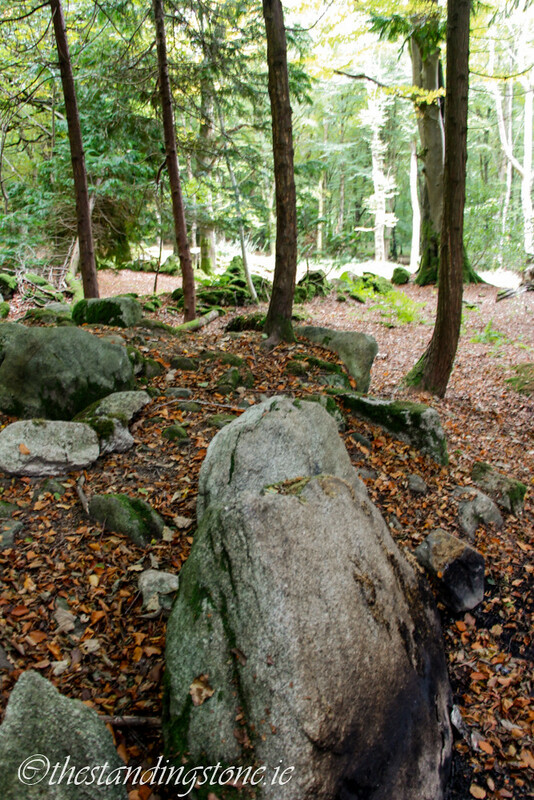 As to the cairn material, it was probably used to build the stone walls that run through the forest here. Part of a wall runs across the western end of the tomb. 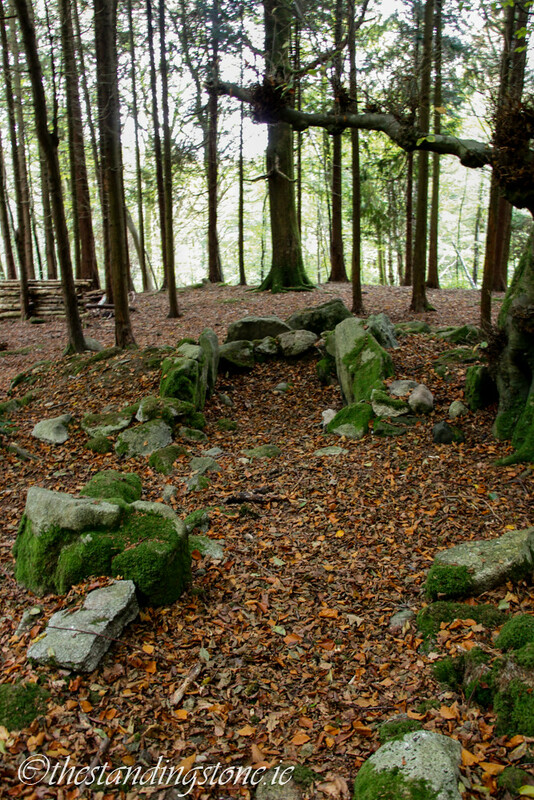 Two other tombs sit within a radius of 3.5km of here, Ballyedmonduff and Kilmashogue. I will have to come back to visit these tombs. There must have been a thriving community in this area. Today this tomb sits in Massey’s Estate forest park, the former lands of the Massey family who has their estate here. 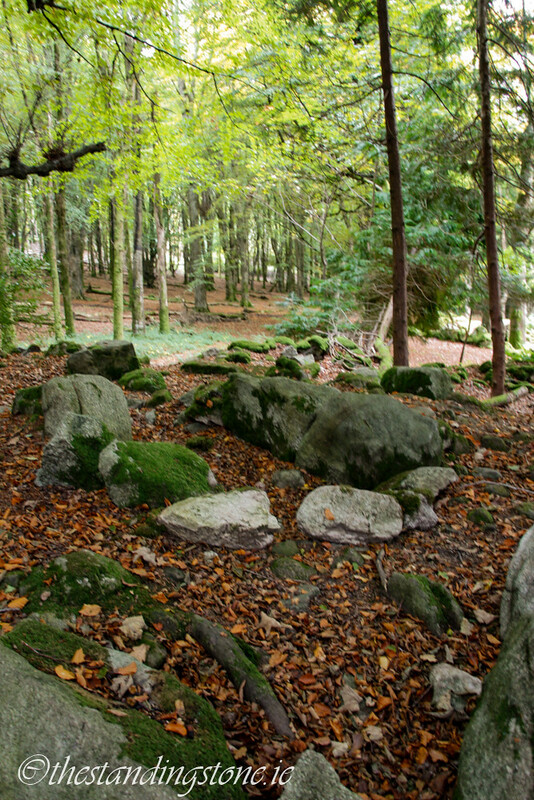 The forest is dotted with relics of their former estate and you could spend the day here hunting out bits and pieces. 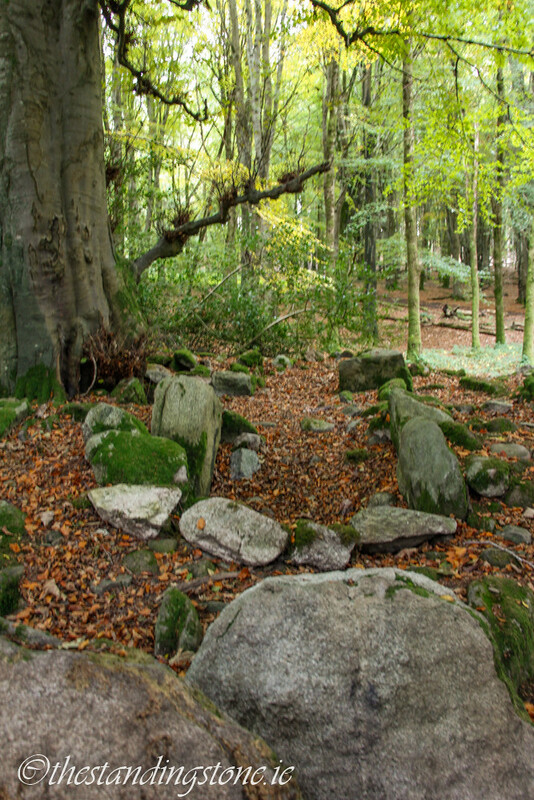 Difficulty – It’s an easy enough walk along the forest lane but can be a little muddy in places. 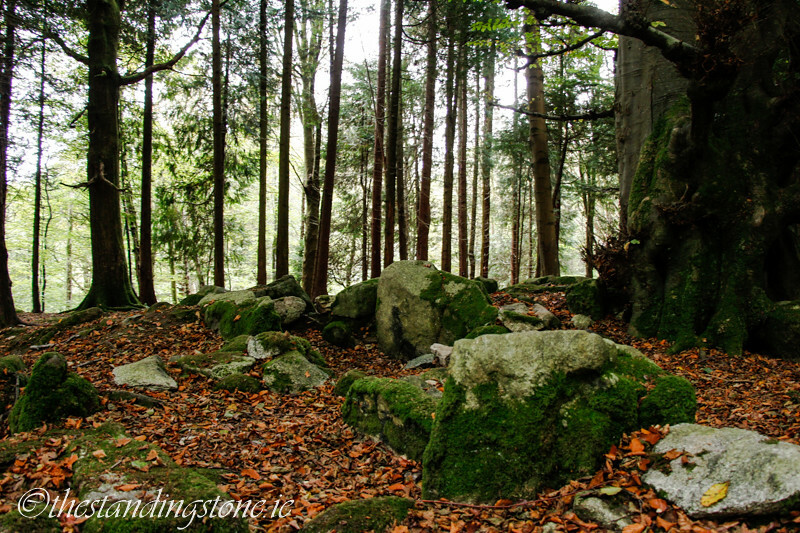 When you leave the road and walk through the forest it’s a little trickier but not overly difficult. 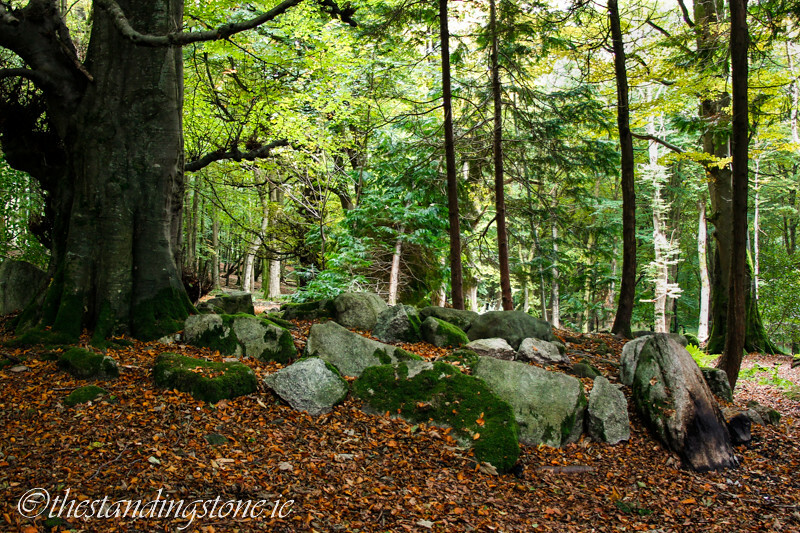 For more sites in Co. Dublin, click here. The tomb as viewed from the East. From the West looking into the chamber. From the East again looking along the chamber from the rear stones. While the tree is charming the roots could be doing severe damage to the tomb. Someone has obviously had a small fire against the rear stone. Note the three layers of walling. 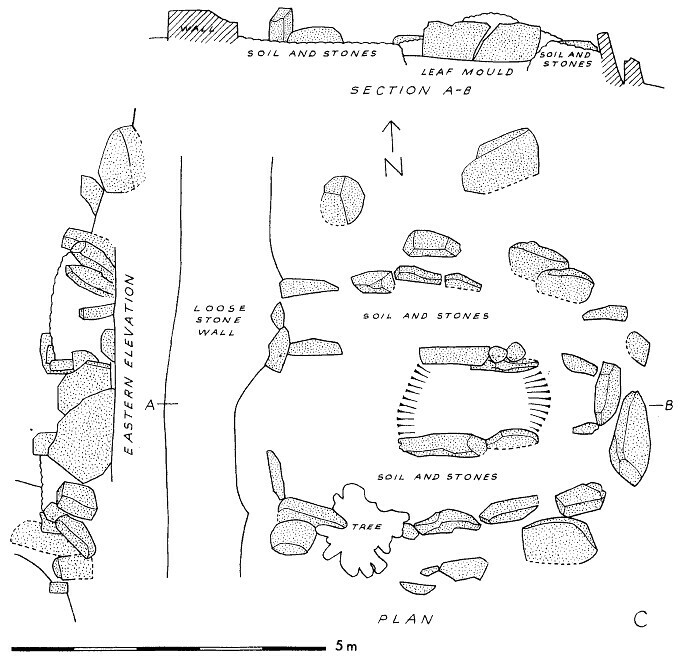 This plan comes from HÉailidhe, P. Ó. 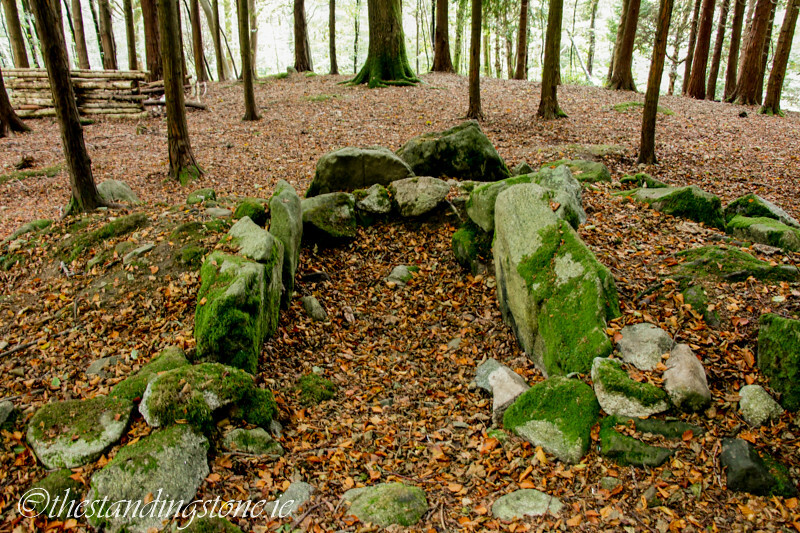 "An Unrecorded Wedge-Tomb at Killakee, County Dublin." The Journal of the Royal Society of Antiquaries of Ireland 108 (1978): 101-03.